Lauren Beukes is a South African novelist, short story writer, journalist and TV scriptwriter. She lives in Cape Town, South Africa. Her novel Zoo City won the Arthur C Clarke Award and the Kitschies Red Tentacle. Her latest novel The Shining Girls about a time travelling serial killer is published today. In South Africa, we have a great expression, “picking up stompies” (cigarette stubs) which means eavesdropping on snippets of a conversation and jumping to conclusions. I pick up a lot of stompies, from stuff I’ve read or seen or overheard or glanced from the car window. If I’m lucky, sometimes something sparks in my subconscious and sets a story alight. The idea for a novel about a time-travelling serial killer was a happy accident on Twitter. I threw out the idea in the middle of some silly banter and immediately deleted the Tweet. I had to write that, right now, before someone else thought of it and because I knew I could do something really interesting with it. I abandoned my work in progress and started writing The Shining Girls on the plane. I had the general form of it. An impossible mystery that could only be solved by an improbable survivor. It’s about Harper, a mean, low-down killer from the 1930s who hunts young women through the decades and Kirby, the fiery young journalist who turns the hunt around in the 90s when Harper fails to kill her. But more than that, it’s a story about obsessions that take over your life, free will and fate, how we have been shaped by the 20th Century, the loops and echoes of history. All that meant it absolutely couldn’t be set in South Africa. The ugly narrative of apartheid would have overwhelmed all the other things I wanted to talk about, like segregation in other places, women’s rights, protest culture, McCarthyism’s precedent for the War on Terror, economic depression, highways rewiring cities and the ripples violence sends out through society. So, I set it in Chicago, the birthplace of the skyscraper, and, conveniently, somewhere I’d lived for a while. I still had to do a lot of research. I devoured books on the city, from the wonderfully salacious and seedy Chicago Confidential by Jack Lait and Lee Mortimer published in 1950 to Jim deRogatis’s Milk It: Collected Musings on the Alternative Music Explosion of the 90s and Gang Leader for A Day by Sudhir Venkatesh, listened to Studs Terkel’s oral histories and true crime podcasts on serial killers, and hired two part-time researchers to dig up fascinating real snippets of history about a real-life burlesque dancer who painted herself up in radium, for example, or the underground women’s organization, Jane. journalists and historians and inveigled my friends to take me around on location scouts, driving through Englewood, or prowling through the creepy back corridors of the Congress Hotel or choreographing a murder scene on Montrose Beach. Keeping track of it all was something else. Because while Harper follows the typical serial killer’s trajectory – becoming more elaborate and more violent as he goes on, his MO is all over the place. He’s more violent in 1984 and less violent in 1993, for example. But he also leaves trophies on the bodies to connect his victims in a murder constellation through time, because he’s sick like that. I dealt with being in his head by hurting him whenever the opportunity presented itself: dog bite, torn tendon, broken jaw, which meant I had to keep an eye on his current state and how he was healing. I ended up with three major timelines: the killer’s, the way the book plays out and the actual historical timeline from 1931 to 1993, which I charted over real events from specific baseballs games to the riots of the 1968 Democratic Convention. I had to map it all out on the space above my desk with a murder wall: timelines and images, criss-crossed with red and black and yellow wool to link the objects and the killings across the years. The Shining Girls is a departure from my previous novels. Fans of The Shining Girls may get a shock if they go back to read my earlier novels. Zoo City is a black magic noir set in the inner city slums of Johannesburg. Moxyland is a future political thriller that plays out in Cape Town in a neo-apartheid state. They’re all radically different. But then, it’s not really up to me. I write the stories that occur to me, that are nagging to be told. I don’t know what spark will set my brain ablaze, I’m just the person who has to try to direct the fire and cordon it off with red wool if need be. More information about Lauren and her work can be found on her website. 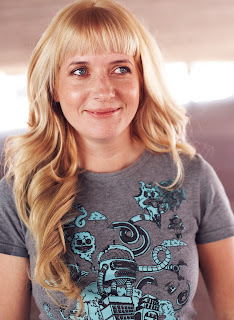 Lauren can also be found on Twitter @laurenbeukes and on Facebook.